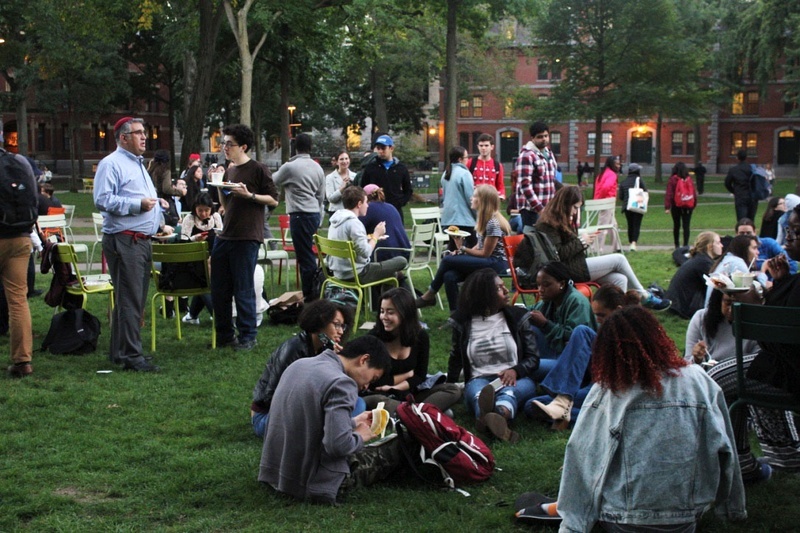 Students show support for striking HUDS employees by eating dinner in Harvard Yard Thursday evening. The dine-in was organized by Harvard Student Labor Action Movement in support of the HUDS workers’ ongoing strike. UPDATED: October 7, 2016, at 11:06 p.m.
Thursday’s negotiation session between Harvard and the union representing its dining workers did not yield a settlement on a new contract, but the two parties have scheduled another session for Friday. Harvard University Dining Service workers will continue their historic strike over the holiday weekend, according to Tiffany Ten Eyck, a spokesperson for UNITE HERE Local 26, the Boston union that represents HUDS. Negotiators from Harvard and Local 26 have been in contract talks for nearly four months, debating over health care benefits and wages. On Thursday, two outside mediators—Economics professor Lawrence F. Katz and Robert B. McKersie, professor emeritus at MIT’s Sloan School of Management— joined the parties at the bargaining table to help facilitate the talks, according to University spokesperson Tania deLuzuriaga. Ten Eyck described the negotiations Thursday, the 20th bargaining session since talks began mid-June, as a “positive conversation” in which the two parties provided relevant background information to the mediators. HUDS workers began their strike Wednesday, picketing for the first time in more than 30 years, in the hopes of pressuring Harvard to comply with their wage and health benefits demands. The University has employed temporary workers and managers to staff dining halls across campus during the strike. 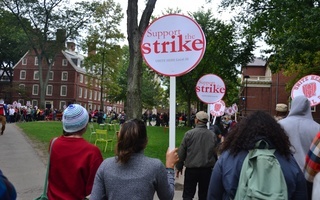 Ten Eyck said about 700 people picketed in and around Harvard Yard during the strike’s second day, including students, workers, and supporters from Boston. The University has brought forth several health care proposals over the course of the past four months; Local 26 has rejected all of them. Harvard proposed the union enroll in an identical health plan to that Harvard negotiated with the University’s largest union, the Harvard Union of Clerical and Technical Workers. That plan eliminated deducibles while it increased copayments. Additionally, the plan established a premium contribution tier for workers who make $55,000 or less. On Monday, Harvard specifically attempted to address a union demand that HUDS workers be provided with the opportunity to work year round. Currently, dining service workers laid off during the University’s summer recesses and are unable to draw unemployment. Additionally, the union has demanded that workers who make themselves available to work year-round be provided with a “minimum guaranteed salary” of $35,000, according to Ten Eyck. According to deLuzuriaga, the average HUDS worker makes $34,000 annually,but the union has disputed that number, saying it their salaries are closer to $31,000 per year. When asked what health care proposals the union has put on the table during the course of the negotiations, Local 26 leadership has declined to comment beyond indicating that they will not accept a proposal that causes their workers to shoulder additional out-of-pocket costs for health care. Local 26 has largely sought to maintain the contract HUDS had last year. ​A 22-day dining services’ worker strike officially ended Wednesday after employees voted overwhelmingly to approve a new contract with Harvard, capping off months of tense negotiations with the University. 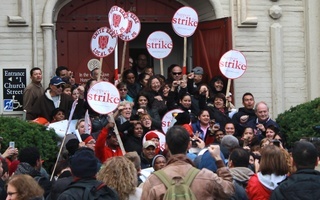 Finally, the strike has come to a close—and, it seems, on HUDS workers’ terms.